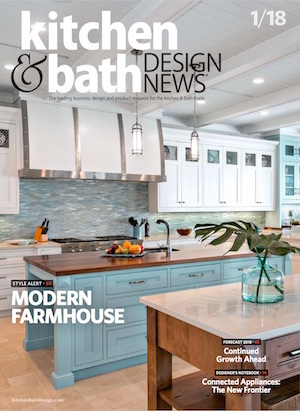 [Amissville, Virginia – January, 2018] — Local kitchen designer Sandra Brannock, owner of Expert Kitchen Designs in Amissville, Virginia, has won national recognition for her creative problem solving and kitchen design skills in the current edition of Kitchen and Bath Design News — a national publication serving kitchen and bath designers and the leading business, design and product resource for the kitchen and bath trade (www.kitchenbathdesign.com). 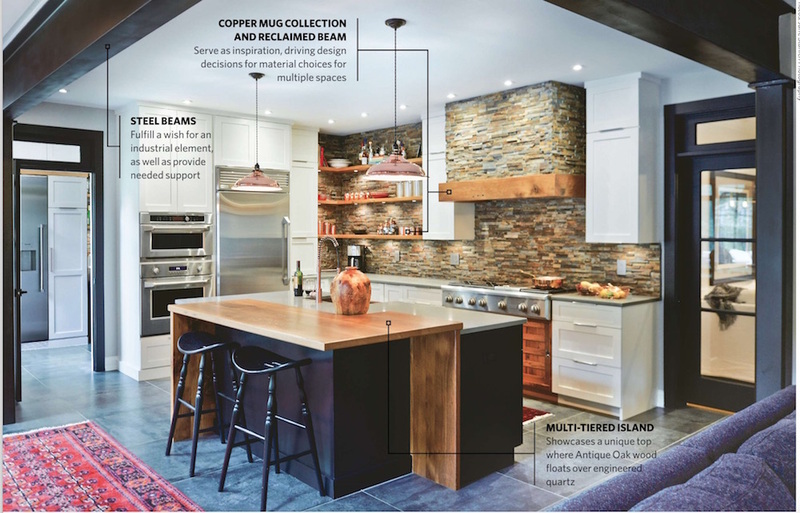 The January 2018 magazine article (Bold Decisions Drive Kitchen Design, pages 58-62) shows how Sandra brought her clients’ vision to life and transformed an outdated Clifton, Virginia kitchen and laundry room into a dramatic, livable and functional new kitchen, pantry and mudroom. blackish steel beams to provide needed structural support. Key design challenges that Sandra addressed included a poorly-placed kitchen sink adjacent to the laundry room and a single column dividing the great room from the kitchen, which the clients wanted to eliminate. The husband — a former professional chef — also wanted to incorporate “proper cooking appliances” that challenged the original footprint of the kitchen. 6) A new multi-purpose room that serves triple functions as a laundry room, pantry and mudroom. If you would like more information about this topic, please call Sandra Brannock at (540) 801-6402, or email sandra@expertkitchendesigns.com.